Bobby Kondors, Maurice, Underworld, The Fixx, Robotman and more. Voici, another of my experimental arrangements, where I remix some tracks but within an overall dj mix. To start it off, we have 2 legenary classics by Bobby Kondors. Included is a P. Oakenfold remix of the legendary Russian rock group (call it alternative, if you will) Kino&apos;s anthem, Peremen (We want Change). Hard to pin the overall feel of this work, running the gamut all the way to Krautrock (dare I say the 1st remix of a Neu song?). Again, I stick close to that old-school, early 90s sensibility. I don&apos;t feel quite finished with this, but I will have to set aside any more production for a couple of months while I go on a spiritual journey. 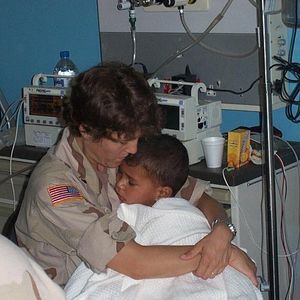 The pic is of one of our nurses when I was in Kuwait for the invasion of Iraq. She&apos;s hugging one of a few Iraqi kids that were injured and evacuated away from the hostilities for treatment. In place of fire is smoke. From calender taken the day. The ray falling on the flaming city. But in the kitchen in blue colour burns the gas. And there isn&apos;t something else, everything inside of us. We don&apos;t need it to understand each other. And suddenly we afraid of changing something. I thought that I might start providing some of my philosophies incorporated into my arrangements for anyone who might care. Anyhow, I think it couldn&apos;t hurt. There has been much said in old school techno/house communities about what skills and or technologies might be necessary for a true underground DJ. These thoughts do have their merit. This aside though, I think foremost for the craft to be perpetuated you need to at least attempt to be an artist. Even though you are not in a conventional sense (the most popular criticism pointed our way) being a trained and practiced instrumental performer, you should be offering up whatever MUSICAL contribution you have to the continued conversation on what precisely is this art that we are propagating.